First off, U.S. Skulduggery fans: No, these books haven't been published here. I ordered them from abroad. Hey, the U.S. publishing world gave up on this series and didn't want me to read these books, but I got around them. I feel like a the main character in a spy movie. Yeah, Angelina Jolie taking down the man. My niece lent me the two Skulduggery Pleasant books I bought for her in March. To be honest, I found them slow getting into, in large part because there's more and more of a serial aspect to these stories now. In fact, when my niece handed them to me, she said, "They're really getting into cliffhangers." With a serial, it's hard to bring yourself up to speed if you haven't read the earlier books recently. There's a wide array of bad guys in the Skulduggery Universe, and, personally, I can't keep track of them over a long period of time. For instance, somebody named Lord Vile becomes important (again, I guess) in Death Bringer, and while the name rang a bell, that was all it did for me. Both books did develop a certain...magnetic...aspect, though, drawing me back to them over and over. In large part, this is due to clever conversation. I would be hard put to recall the basic stories in any of these books. Many characters, however, are marvelously entertaining. 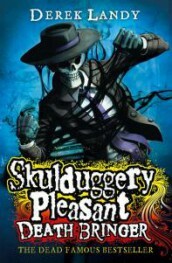 Skulduggery Pleasant is a standout, of course, and he has had a big impact (some would say a bad influence) on his sidekick, Valkyrie Cain, who is the real protagonist in this series. But a wide array of secondary and even minor characters are clever and funny. Scapegrace the zombie, for instance. Valkyrie's parents. Her nitwit cousins. Clarabelle, who doesn't appear to be the brightest light in the sorcerer world. In fact, I'm not sure how she came to be part of it. Wit and humor are what carries these books. The plots, no so much. The sixth book, Death Bringer, includes an incredibly clever thread (I hate to even call it a subplot) that rips into Twilight's Edward Cullen big time. It's brilliant. I appreciated it a great deal. But it really doesn't have anything to do with the book's basic story, which involves an attempt to kill half the world's population. In fact, this book has a torn-between-two-lovers scenario that I suspect only exists so Landy can make fun of Twilight. Hey, I love making fun of Twilight as much as the next person. More than its many fans. But here the pleasure I took from the humor was distracting. Here's a fascinating thing that's happening in these later Skulduggery Pleasant books: Valkyrie Cain is becoming more and more unpleasant. I suspect that some of this attitude of hers was always there, but she's now becoming just plain nasty. She has a sort of shadow person who lives her mortal life for her so she can be off saving the world from paranormal bad guys without upsetting the folks. By the fifth and sixth books, Valkyrie is treating it like...yeah, mud, let's say. We may find at some point that this is due to some kind of envy because the duplicate gets to be part of the family Valkyrie has to leave, but in the meantime, Valkyrie is really awful to it. She's pretty dreadful to the two boyfriends. She has the...mud...beaten out of her by a character who is seeking revenge for all the cruel taunts Valkyrie has directed toward her in the past. Valkyrie doesn't seem to get that she had a part in bringing that down upon herself. She tosses around the words, "Shut up" and "Moron" as if they are fine examples of witty repartee, which they most certainly aren't, in case anyone is wondering, not even here. She is turning into a very unlikable main character. I like that. I find it intriguing. Where is Landy going with this? Or is he going anywhere with it? Does he find her as unlikable as I do, or does he, indeed, believe, "Shut up" is the soul of wit? I suspect that Landy is intentionally going dark and unlikable, because I recently learned he has started a new series featuring Tanith Low, a character from the Skulduggery Pleasant Universe who went over to the side of evil in a big, big way. He is doing a whole series with a main character who is a bad guy. This flies in the face of Writing 101, where writers learn that protagonists must be likable so that readers will want to identify with them. This is fascinating. I now want to know how dreadful Valkyrie is going to become. I broke down and ordered book seven in the Skulduggery series, Kingdom of the Wicked, which just goes to show that unlikable characters can sell books. Years ago, when I interviewed Derek, I asked him if Val, such a hater of the whole boy/girl thing, would ever go Bella and find some redemptive qualities in the whole otherworld-lover thing. And he laughed and laughed. "Oh, noooooo." And, the continued Twilight mockery definitely echoes that "nooooo." However, I do take your point about wondering where the heck this is all going to go. I'm sad that American kids didn't take to this one. The antihero is really a vastly under-explored genre. I wonder if the problem wasn't the marketing to adult gatekeepers in this country rather than American kids not taking to it. I'm a very picky fantasy reader. I don't like a lot of traditional fantasy. I like out-of-the-box types of stuff like this and "Curse of the Wolf Girl" kinds of things. And that might be the problem with marketing this. It may be too out of the box, not fitting into traditional, kid fantasy, which I think tends to be very serious and formulaic. This series is funny. 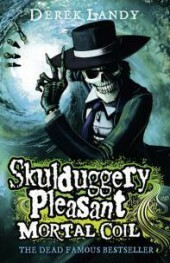 Its main character is not Skulduggery Pleasant, whose name is on the books. Percy Jackson and Harry Potter live in child worlds of summer camp and boarding school. Valkyrie Cain is a child functioning in a world of adult sorcerers. It may be that adults didn't know what to do with this.